The Lowry Foundation’s Board of Directors are pleased to announce that in 2015, our Community Grants program is supporting the “Food for Kids Backpack Program” at Lowry Elementary School (LES). 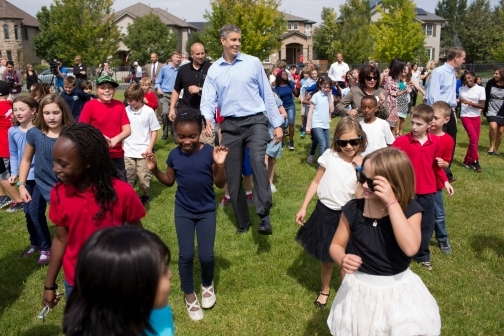 Education Secretary Arne Duncan dances the "Cupid Shuffle"
with students at Lowry Elementary School in Denver, CO. The Lowry Foundation with support from Larimer Associates, hosted The Lowry Beer Garden’s 3rd Anniversary Event on May 28th, to celebrate and once again support the Lowry Foundation! During the event, guests enjoyed food and Colorado craft beer. All proceeds from the ticket sales benefited the Lowry Foundation and the Lowry Elementary School’s Food for Kids Backpack Program.